24 SMT Magazine • August 2015 much fanfare. Avid consumers line up for the next tech fashion items, even before their old products have reached end of life. It has been said that economics runs on the premise that wants exceed needs. Product marketers do their best to convince the consumer that the things they want are truly needs. Does everyone who stands in line need that new device? No, they do not, but it serves the purpose of the market- ers who really do not care much about failure because it is an opportunity to make and sell a replacement. In 1932, Bernard London, author of "Ending the Depres- sion through Planned Obsoles- cence," prescribed destroying outdated products and casti- gated those who tried to get longer life from still service- able items. In his time, it ar- guably made some sense. The times were definitely more egalitarian then. A contem- porary of London was Aldous Huxley, who also wrote, in- terestingly enough, in 1932, "Brave New World," but it was about a dystopian future, any- thing but egalitarian, where hypnopaedic messaging such as "Ending is better than mending" and "Less stitches means more riches" were broadcast to the populace to get them to toss out the old and buy the new. Ironically, Huxley offered up the same message as London did but having a grimmer, more disparaging viewpoint. We are arguably in that time now to some degree as we are more accepting of failure. Who has not heard a friend or colleague say, "I wish my old phone would die so I can get a new one?" This attitude does not serve well the future needs of the planet, if everyone on the planet is to be served. Think now of the individual in a developing nation, somewhere in the world, who is making $2 per day. When that individual purchases an electronic product or any other product for that matter, their fondest wish is that the product will last indefinitely (or at least until the end of their need) because, no matter the cost, it is necessarily viewed as a lifetime purchase. More- over, the world needs them now more than ever to have those reliable products so they can lift themselves out of grinding poverty due to a lack of education. Handhelds and wireless commu- nications are key to allowing them to get that education and perhaps bless the planet by al- lowing us to tap all of the untapped genius that goes unrealized and unused—a great pity and loss. The world's poor are, ironically, much like those customers in military, aerospace, medi- cal and automotive product mar- kets. Failure is not an acceptable option if it can be avoided. To serve their needs a war on fail- ure must be waged. The Battleground Failure, in electronics, while not necessarily desired by either manufacturer or con- sumer, is expected. We are, in a sense, inured to failure. We expect problems. This is not to say that the industry has not attempted to improve reliabili- ty. Much is being done in an ef- fort to improve reliability with new solder alloys, new fluxes, new materials, new equipment and process parameters, etc. 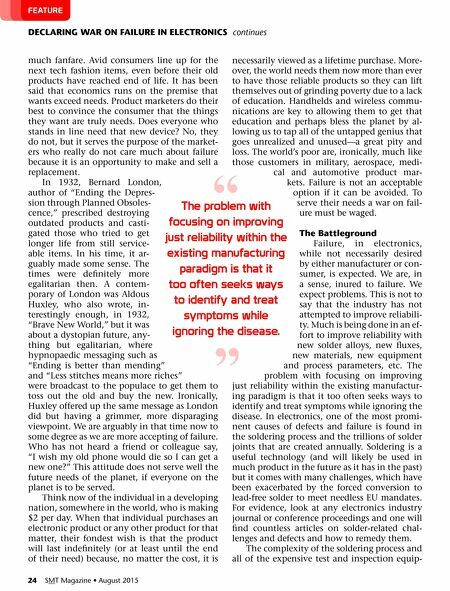 The problem with focusing on improving just reliability within the existing manufactur- ing paradigm is that it too often seeks ways to identify and treat symptoms while ignoring the disease. In electronics, one of the most promi- nent causes of defects and failure is found in the soldering process and the trillions of solder joints that are created annually. Soldering is a useful technology (and will likely be used in much product in the future as it has in the past) but it comes with many challenges, which have been exacerbated by the forced conversion to lead-free solder to meet needless EU mandates. For evidence, look at any electronics industry journal or conference proceedings and one will find countless articles on solder-related chal- lenges and defects and how to remedy them. 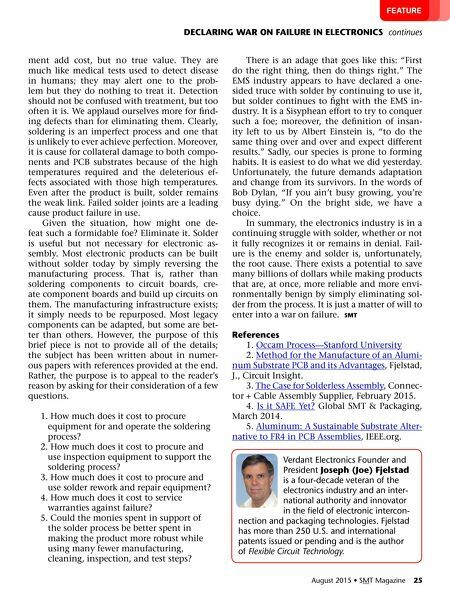 The complexity of the soldering process and all of the expensive test and inspection equip- DECLARING WAR ON FAILuRE IN ELECTRONICS continues FeAture the problem with focusing on improving just reliability within the existing manufacturing paradigm is that it too often seeks ways to identify and treat symptoms while ignoring the disease. " "